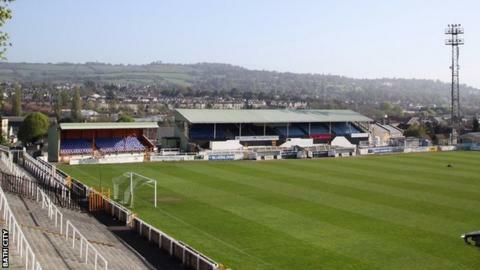 Bath City chairman Manda Rigby says the club could fold unless they sell their stadium in Twerton. The Blue Square Bet South outfit have been based at the 8,000-capacity Mayday Trust Park since 1932. The Romans' relegation last season left the club in financial turmoil and, after posting a deficit for 50 consecutive years, Rigby says they must sell the ground to stay in business. "We are very serious about having to do this," she told BBC Radio Bristol. "The board have done a brilliant job at keeping the club going, but we're getting to a point where time and money is running out. "We've had 50 years of debt accumulating and at some point someone is going to have to come up with a plan to pay that back." Rigby said redeveloping the current stadium was also an option for the struggling club. "It's a lovely stadium but we are having to spend more and more money," she continued. "We said about six months ago that we had two options: to redevelop Twerton Park and/or moving. "Now is the time for me to come out and say the plan I've got is to move. People have got to get on board with that or find an alternative." Bath's most successful season on the field came in 2010-11, when they finished 10th in the Blue Square Bet Premier, but Rigby admitted that competing with full-time clubs left them with "an unsustainable level of expenditure". Last term, the club invited the public to pay £50 to enter a draw to rename the ground in a bid to raise additional funds.